In our first post, we talked about the remarkable historic resiliency of movie attendance, and last week we illustrated the impact on production budgets. Rising budgets have been met with rising ticket prices, and 3D releases have been an important contributor. At one point, 3D was heralded as the savior of movies at the box office. Recently, though, admissions have been declining, and growth in ticket prices has tapered off over the last three to four years. While there is no denying that 3D has a significant impact on the industry, what exactly has this impact been, and what does it look like going forward? 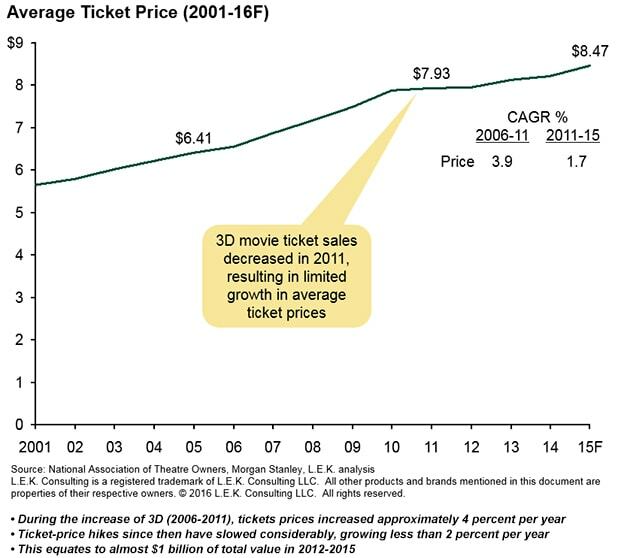 The increased availability of 3D movie releases helped drive movie-ticket price increases, but the upside potential may be limited. In the five years before 2011, (domestic) exhibitors added nearly 13,000 3D screens in anticipation of demand. Since 2011, (domestic) exhibitors have only increased capacity by approximately 1,800. 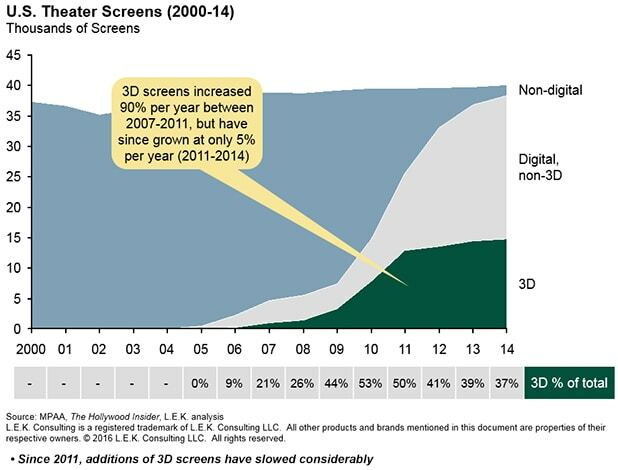 Growth from the technology may be plateauing as screen conversion slows, and that is likely to have an impact on production. 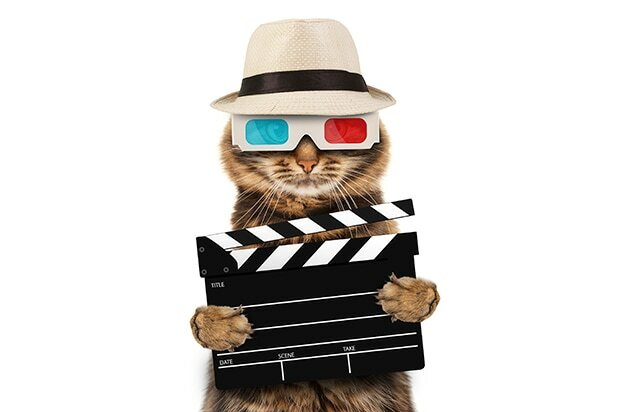 Studios and producers ramped-up production of 3D movies significantly in 2009-2010, reaching a peak in 2011 with 45 releases (7.4 percent of all film releases). However, since 2011, we’ve seen a steady decline in the percent of film releases that have been made in 3D, down to a modest 6.6 percent in 2014. Studios’ enthusiasm for the format in 2009-2011 has since cooled. 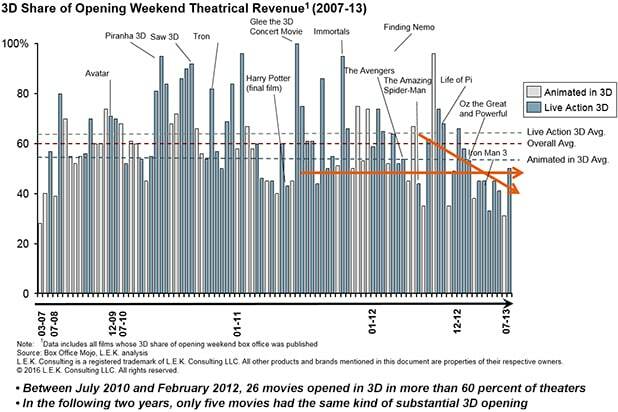 As illustrated in the chart below, opening a movie in 3D used to be an enticing proposition for audiences, as approximately 60 percent of opening weekend gross for a film that opened in 2D and 3D came from the latter; that figure has recently ebbed to a more temperate approximate 30 percent. Many in the industry believe that 3D is here to stay, but that it has likely achieved or is near achieving its steady state. 3D was a much-needed infusion to the industry… what’s next? Our next post examines the international frontier for Hollywood. 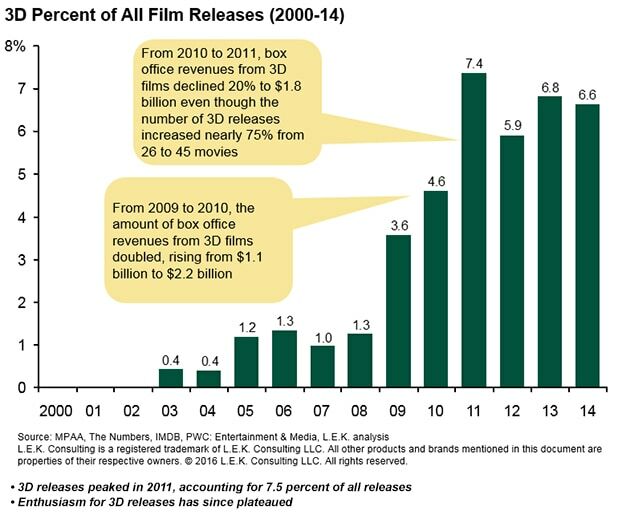 This is Part 3 in a series on box office trends by Dan Schechter, Gil Moran and Michael Kaufman from L.E.K. 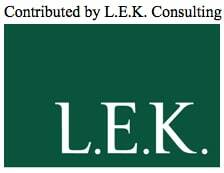 Consulting’s Media, Entertainment & Technology consulting practice.